The recipe card, instructional video and nutritional information is at the bottom of the post, but don’t be too hasty – the post contains all the tips and tricks. 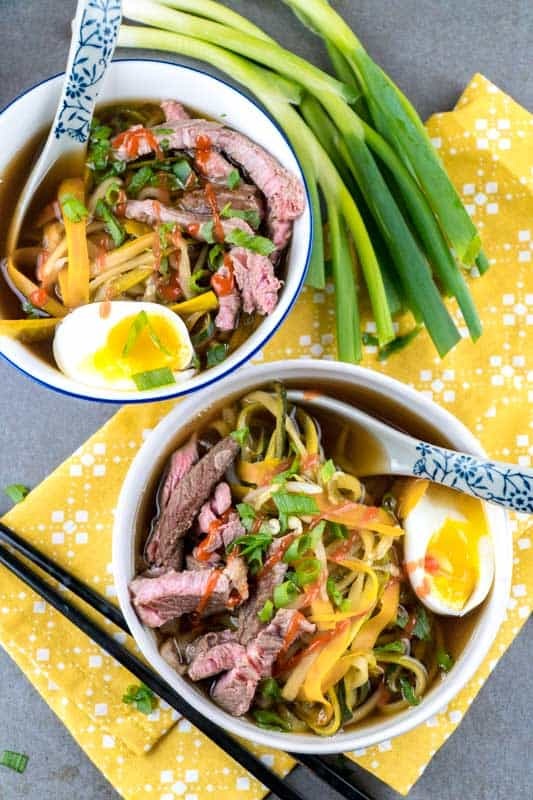 …All swimming in a delicious broth you’ll want to drink up with a straw. 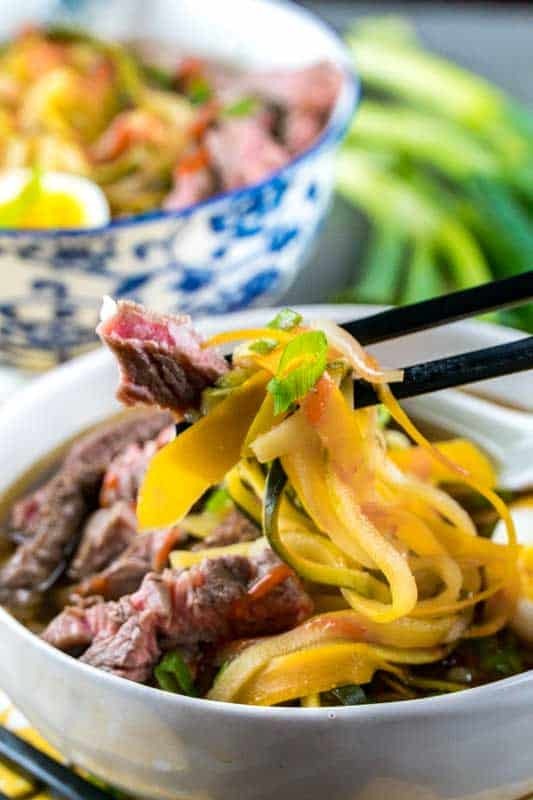 I’m currently obsessed with our easy peasy recipe for Authentic Beef Ramen with Zoodles! I’m one of those “foodies” that like easy instant ramen noodles. The cheap stuff. You know, add a cup of water and microwave for 2 minutes. Even better if it’s the “just add water and wait a minute” type. Because yes. 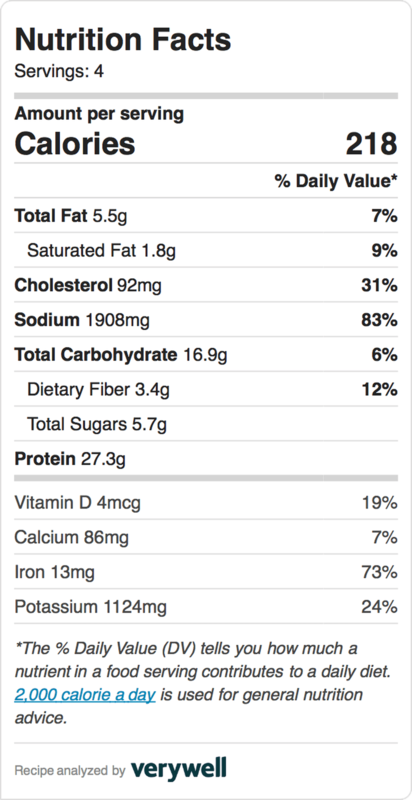 Ramen is not healthy. 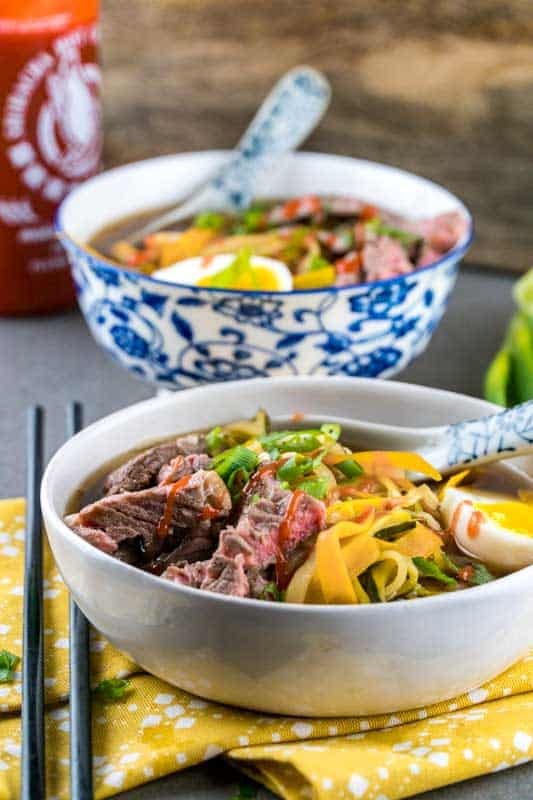 But, the whole point of Living Chirpy is taking our favorites and transforming them into healthier and low carb-ier versions – and our Chirpy-fied Beef Ramen recipe definitely falls into the “hell-yes-this-is-amazing-let’s-eat-it-again-asap” pile. 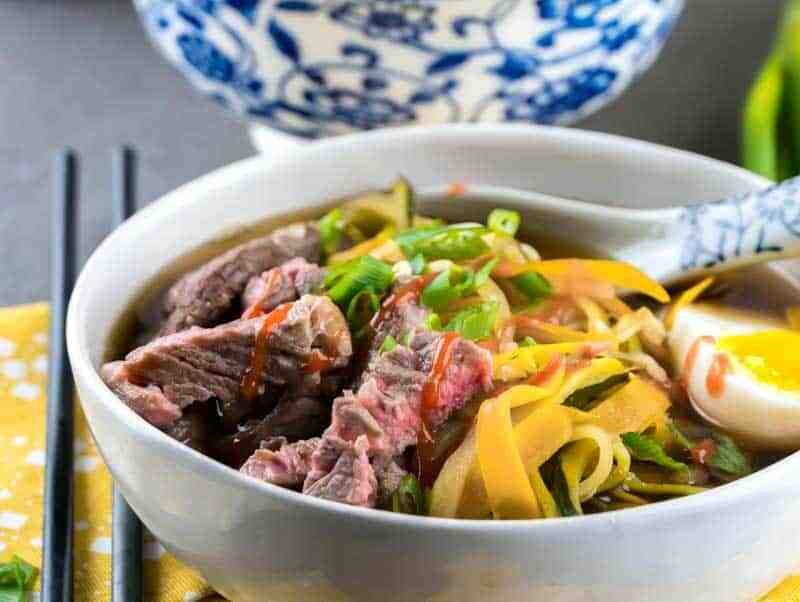 How to make healthy beef ramen? While the beef sears, everything else heats up in a pot next to it. Once the veggies are cooked to your desired level, dump in the beef and serve it up immediately. Whether you’re talking Korean or Japanese or Mongolian Ramen, it doesn’t matter. It’s all amazing and addictive and this recipe hits the spot every time. Mix all the ingredients for the broth in a pot and bring to boil. While waiting for the broth to boil, sear the thin beef slices on a hot pan. Add the carrot ribbons, bean sprouts and scallions to broth. Cook for about 5 minutes. Add the zucchini noodles and cook until the noodles are to your desired level of done-ness. 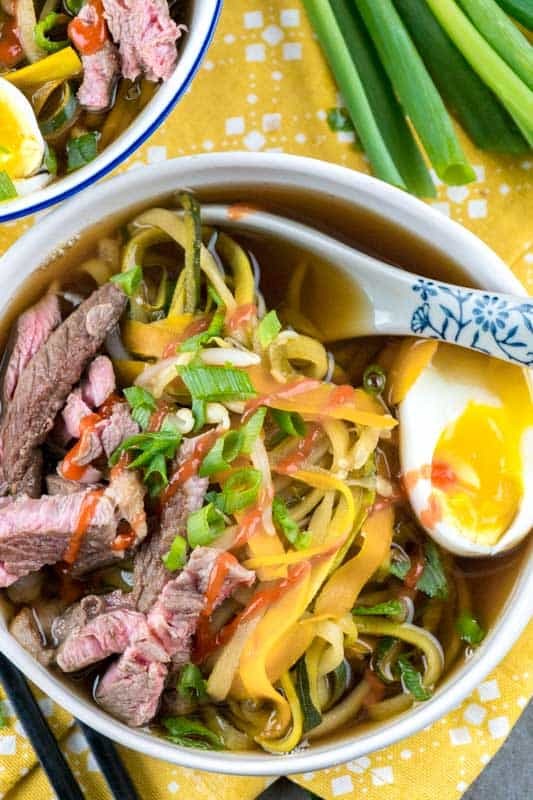 Dump the beef in the "soup" and serve it up! We recommend a squirt of Sriracha for some heat and extra yummy flavor! We've used our Veggetti Spiralizer for many years and still love it. If you want something more versatile and substantial though, we recommend this one. 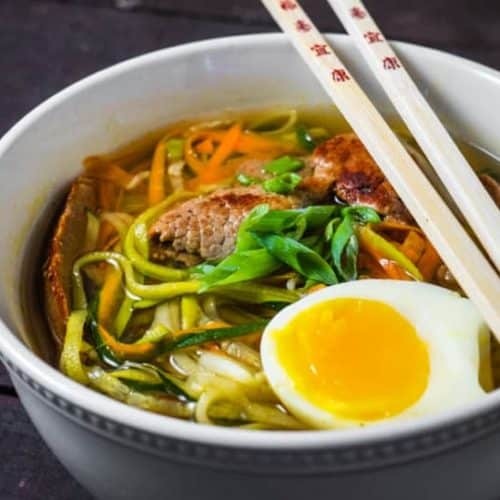 Can you tell me how many carbs this Ramen Zoodles is? Hi Patty 🙂 Unfortunately I unable to provide nutritional information on my recipes as I am not a registered dietitian/nutritionist. There are lots of website you’ll be able to find with through a google search that allows you to enter a recipe and then gives you an estimate of the calories. Hi there, the recipe is great, thanks for showing how to use zoodles in a soup. I’d like to point out that mirin is spelt with 1 R. Also “oriental” is not a good look, you can easily change that to Asian section of the grocery store. The recipe looks delicious and I can’t wait to try it! Just wanted to confirm that “oriental” is no longer considered an appropriate term to use for Asian culture. It is better to use the term “Asian section of the grocery store” instead. Are we (America folk) doing away with the Orient as well? I really want to make this recipe. I am not sure what makes the broth. 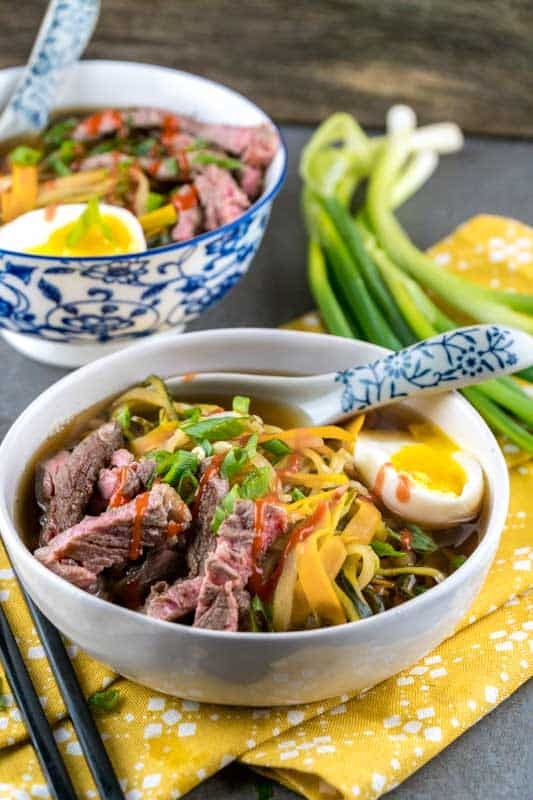 How much beef broth do you use and what are the ingerdients that make up the broth? You can also add a bit of Sake and of course Sriracha or your hot sauce of choice! Sooooo sooo good. Wish I had done the steak a little different to make it more tender. I’m such a noodle fanatic- and this hit the spot! Some of you don’t have a clue, bet you’re snowflakes…. Asia could be India, Sri Lanka, whilst this food is definitely from there. It’s from the Orient, hence the term “Oriental” was indeed properly used and in no means slanderous. Wake up. And authentically oriental at that!